And so it is that a film which fancies itself as an antidote to the exuberance of Guy Ritchie’s Sherlock Holmes, yet borrows heavily from the plot structure of The Bone Collector, lacks the sense of intrigue necessary to make it the workable and intelligent piece of crime fiction it longs to be. The film centres on a series of grizzly murders which appear to be based on the macabre works of Edgar Allen Poe. Detective Emmett Fields (Luke Evans) then enlists Poe (John Cusack) to help catch the killer. 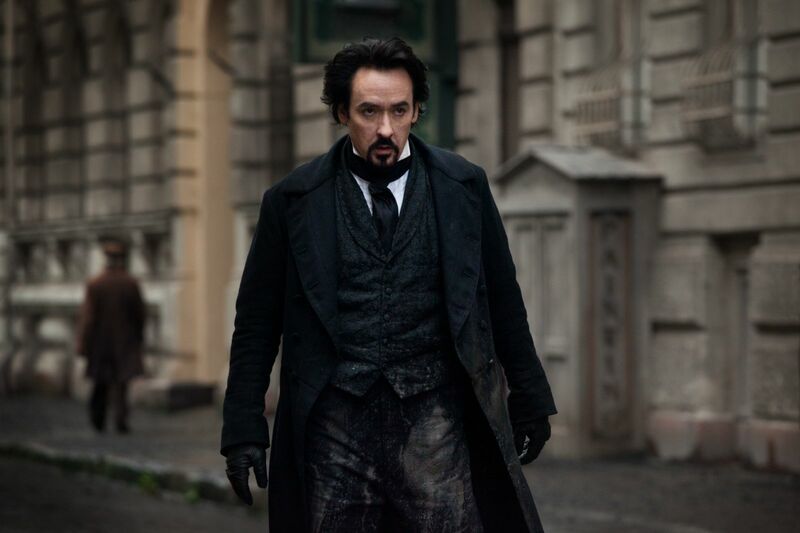 Part of the problem with the film though is Poe, and specifically John Cusack. While he certainly looks the part, he is simply never convincing as anything more than an incompetent sidekick to a marginally more competent detective. As a literary genius, despondent in the grips of alcoholism and ego, he fails dismally, lacking the brooding introspection and melancholy the character surely needs. In terms of the film’s portrayal of Poe, for a writer who single-handedly invented detective fiction with his Monsieur Dupin stories, his on-screen lack of deductive skills is also disappointing. The dialogue though is colourful enough, and writers Ben Livingston and Hannah Shakespeare deserve praise for the script’s glimmers of dry wit, even if not all of it is delivered with the necessary energy from the cast (Brendan Gleeson is the exception – it is impossible not to have on-screen energy when you’re sporting such luxurious mutton-chops). Director James McTeigue (V For Vendetta) opts for a camp horror tone vaguely reminiscent of Tim Burton’s Sweeny Todd, which is a good thing – the scenes of fatal injury and dismemberment are lavish in their use of gore. For avid readers of Poe’s work, there are constant allusions to spot, some subtle, some less so – his poems are read aloud, everything the killer does is borrowed in some shape or form from Poe’s tales of mystery and imagination, while Poe himself rants in the same elaborate prose he uses in his stories. All these things are fun to discover, but sadly, the film itself is rather less inventive than the yarns from which it draws. But this is it, and hopefully, nevermore.